Discover coconut oil benefits for the skin, hair and scalp! Coconut oil has vitamins, minerals, nutrients and antioxidants. Choline is the most abundant nutrient. This water soluble nutrient is found in the B vitamin family. This nutrient is essential for maintaining normal function of all body cells and the transportation of nutrients throughout the body. Vitamin E and K are present with iron being the most significant mineral. 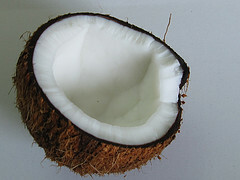 Coconut oil is found in commercial and homemade beauty products, especially in soaps, shampoos, lotions and creams. Coconut oil is a great soap making oil with outstanding properties! It's cleansing, conditioning and moisturizing to skin. It softens hair and helps get rid of dandruff. Its antioxidants combat, skin damaging, free radicals. It adds a rich, creamy, texture and generates a natural bubbly lather. It helps add hardness to your bar of soap. Caution! Too much oil can produce a soap that dries out skin instead of moisturizing it. Learn how to make soap, with coconut oil, the right way. Follow these proven homemade soap recipes! 76 DEGREE: A semi-solid oil that melts between 72 to 78 degrees. High in saturated fats and rich in short and medium chain fatty acids. Good lathering and hardness properties. Popular among soap makers. 92 DEGREE: Liquid at 92 degrees Fahrenheit. Generates less lather. Produces hard bar. Not as popular as the 76 degree kind among soap makers. FRACTIONATED COCONUT OIL: Fraction of coconut oil with, mostly, medium chain triglycerides. Helps retain moisture in skin. Suitable for inflamed, irritated and sensitive skin. Long shelf life and stable. Has more antioxidants and disinfectant properties. First choice among some soap makers. VIRGIN COCONUT OIL: Non-hydrogenated. Natural anti-microbial. Fights viruses and bacteria. The cost is, generally, a little more expensive than regular coconut oil and it generates the same properties. Often, commercial soaps contain harsh foaming agents. Most use cheap refined vegetable oils, mineral oil or by-products of refined oil to generate lather, instead. These chemicals can cause skin sensitization and allergies. Skin can become dried out, tight, flaky, itchy, red, irritated or inflamed. Most commercial soaps DO NOT have antioxidants benefits. Antioxidants are stripped away during the refining process. Skin is left vulnerable for free radical generation. Skin can appear pre-maturely aged with fine lines, wrinkles or discolorations. Skin can appear dull without a natural radiant glow. Coconut oil is used for more than making homemade soap. Use it for making homemade shampoo, lip balm, lotion, face cream and more! A virgin coconut oil in homemade lotion or cream would be a natural anti-microbial with moisturizing and softening properties. It would soothe dry flaky skin. Even though the "virgin" type is a little more expensive, chances are your customers would love it! A homemade lip balm could moisturize and soothe dry cracked lips. A homemade shampoo bar helps get rid of dandruff, soften hair and condition the scalp. Coconut oil benefits the skin, hair and scalp!